The Corcoran was the first museum partner of the Habitat for Artists project, which uses the idea of the artist’s studio as a catalyst for mutual engagement between artists and communities. The “habitats” are small, temporary, 6’-by-6’ structures. HFA invites artists to work in these small, temporary studios. And while exploring their own creative process, the artists engage in active dialogues with a new audience. The public, meanwhile, is invited into a dialogue about art, the artist’s role, and topics pertinent or relevant to that local community. HFA built studios at two sites for this project—the Corcoran Gallery of Art at the corner of New York Ave and 17th St. NW and at the Corcoran’s community partner site, THEARC at 19th and Mississippi Ave SE. 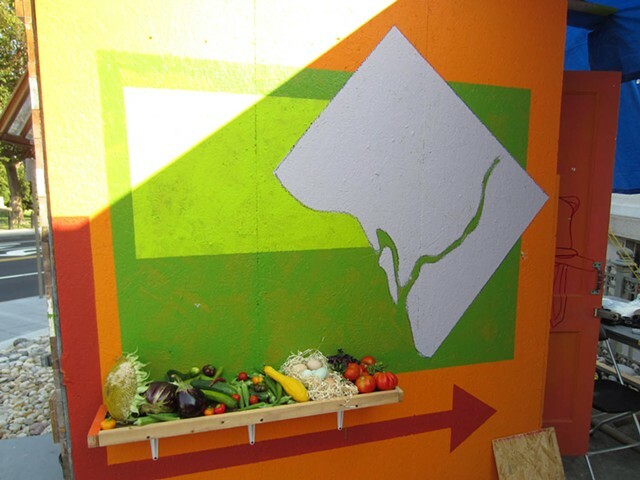 My project at the Corcoran was to explore urban agriculture in Washington, DC and to use the HFA studio as a simple farm stand and information kiosk. Short videos can be viewed on the HFA blog: www.habitatforartists.org/now/michael-a?